1. On my Methods page, I include a section called "Clarity and Deception" where we work together, using input data from my middle-income sample family, to complete Net Price Calculator programs for two universities in the same university system. Both of these schools have very weak financial aid for non-resident students, but the NPC results at one of the schools clearly states this bad news, while the other school hides the cards. The point for you is to know how to spot deception right as it appears so you can dodge potential train wrecks right then. 2. I have a new page, "Four Presidents", where I analyze the financial aid available to the last four American presidents as if they all graduated from high school in the spring of 2018. Two of those presidents, George W. Bush and Donald Trump, were from high income families, and they qualified for no need-based financial aid then or now. But the other two presidents, Bill Clinton and Barack Obama, needed and received lots of financial aid back then, and I show you just how much aid they would receive at Georgetown and Columbia now, as if they graduated from high school last spring. The news for middle and lower income families today will be very gratifying indeed. 3. In my other new page, "Bookends", we work through the Net Price Calculator programs of three schools to give you an idea of the Bookends of your own need based financial aid, meaning the best and the worst it can be. First, I show you the Bookends for one of my sample families, and then I show how to find your own Bookends. I think you will be surprised - and gratified - by your results. APRIL IS "DECISION MONTH." YOUR KIDS HAVE THEIR COLLEGE ACCEPTANCES IN HAND, SO THIS IS A TIME FOR JOY, BUT IT IS ALSO A TIME TO BE WARY. SURPRISINGLY, THE CONSUMER PROTECTIONS YOU'VE GROWN USED TO IN THE REST OF YOUR LIVES AREN'T AVAILABLE TO YOU NOW. AND YOU WILL BE THE ONLY ONES THERE TO PROTECT YOUR KIDS' BEST DREAMS. THE TRUTH IS THAT SOME COLLEGES ARE CONSPICUOUSLY HONEST, BUT A LOT OF THEM AREN'T. AS EXAMPLES, A LOT OF YOUR KIDS ARE ABOUT TO RECEIVE "FINANCIAL AID AWARD LETTERS" WHERE THEY - AND YOU - ARE "AWARDED" NOTHING BUT BUCKETS FULL OF LOANS. READING THIS SITE WILL TEACH YOU HOW TO SPOT THE ECONOMIC DECEPTION THAT SOME COLLEGES FEATURE, BUT - BEYOND COLLEGE ECONOMICS - THERE ARE A NUMBER OF OTHER ISSUES YOU'LL WANT TO REVIEW. I DID MY BEST TO ADDRESS THEM IN MY "TRIPWIRES" PAGE, AND I HOPE YOU WILL READ IT TOO. TEN YEARS AGO, IN THE LAST FULL YEAR OF PRESIDENT BUSH'S SECOND TERM IN OFFICE, OUR CONGRESS PASSED A LAW THAT MADE IT POSSIBLE FOR PARENTS AND STUDENTS TO COMPLETELY ELIMINATE THE RISK OF EXCESSIVE COLLEGE COSTS AND LOANS. THAT REMARKABLE STATUTE WAS SIGNED INTO LAW IN 2008, IT BECAME FULLY EFFECTIVE IN 2011, AND COMPLYING WITH IT COSTS COLLEGES MILLIONS PER YEAR. USING A FREE TOOL THAT WAS BUILT INTO THAT LAW CAN EASILY CUT YOUR COLLEGE COSTS AND LOANS IN HALF. BUT NO ONE - NOT YOUR SCHOOLS, THE MEDIA, OR EVEN GOVERNMENT AGENCIES - TOLD YOU ABOUT IT AND WHAT IT CAN MEAN TO YOUR FAMILY. BUT YOU JUST GOT LUCKY. SOMEHOW YOU FOUND THIS WEBSITE. IT'S COMPLETELY FREE, AND IT WILL HELP YOU TO FIND THE COLLEGES AND UNIVERSITIES THAT WILL BE THE MOST AFFORDABLE FOR YOU AND YOUR KIDS RIGHT NOW, BEFORE THEY APPLY TO ANY COLLEGES AT ALL. THE SKILLS YOU WILL LEARN HERE ARE ALMOST CERTAINLY NOT TAUGHT BY YOUR HIGH SCHOOLS, AND THEY CAN EASILY SAVE YOU $100,000 PER CHILD ON THEIR DEGREES. MORE IMPORTANTLY, YOU WILL LEARN THAT THE COSTS OF THE BEST EDUCATIONS AT THE BEST COLLEGES IN AMERICA ARE EASILY WITHIN THE FINANCIAL REACH OF KIDS LIKE YOURS. SO, RELAX AND GET READY TO LEARN ALL ABOUT AMERICAN COLLEGE GENEROSITY. The purpose of this website is to help middle and lower income American parents find truly affordable colleges for their children while minimizing their college debt. Although the techniques I developed for this site are equally effective for upper income families, my focus is on helping students who are eligible for Pell Grants - students from American families with household incomes less than about $70,000 per year - to find affordable colleges. So, this site is about saving ON college, not saving FOR college. My goal is to help the dreams that middle and lower income American parents have for the educations of their children come true now, within their realities as they exist today, using assets they already have, by making the best use of a freely available online resource. C. Finding these generous colleges, finding schools that will be truly affordable for your family, is the easiest and most reliable aspect of an effective college search. The other aspects of an effective college search aren't that hard either, and they all need to be done, but that law Congress passed in 2008 made finding affordable colleges a piece of cake, and it has continued to be a piece of cake since that law became fully effective in 2011. That law required all colleges to include "Net Price Calculator" programs - we'll call them "NPCs" - on their websites. NPCs allow parents to answer a few questions about their family's finances and get a 97% accurate estimate of their costs and financial aid at that school right then, before their students even apply. NPCs are free, reliable, anonymous, immediate, and secure. And, by using NPC's in your college search, your risk of excessive college costs and loans will be reduced to zero. No joke. NPCs let you immediately identify colleges where costs and loans are too high, and your kids won't apply to them. So, your risk of excessive costs and loans will be zero. ​ The only problem with NPCs is that your high school almost certainly hasn't told you about them. High schools nationwide have been asleep on this for the ten years since this law was passed, and they still are. But, at least for you, that's about to change. You're here, and you're about to learn skills that will change your lives and the lives of your kids. And you'll be astonished by some of the affordable college opportunities available to your kids next year. Congratulations on finding this website, and welcome aboard! 1. Although this site has just been rewritten, the two key documents you will use in finding your most affordable colleges are unchanged. They are included as MS Word files at the bottom of every page in this site, and all you have to do to find your own affordable colleges is to download them, follow the instructions, and get to work. 2. The "American College Generosity" website is intended for parents, counselors, and teachers whose students are already convinced of the value of a college education. If your kids or students aren't at that stage yet, I have another site that can help you nudge them in that direction. The name of that site is "See Your Kids in College;" and it's free, light, easy, and effective. It's methods are intended for students who are about to enter middle school - right when student effectiveness usually tanks - but its methods work for all students. It starts from the fact that college sounds like work, but it looks like fun. I learned the skills I teach in this site by helping our son Gregory find effective colleges that we could all really afford. 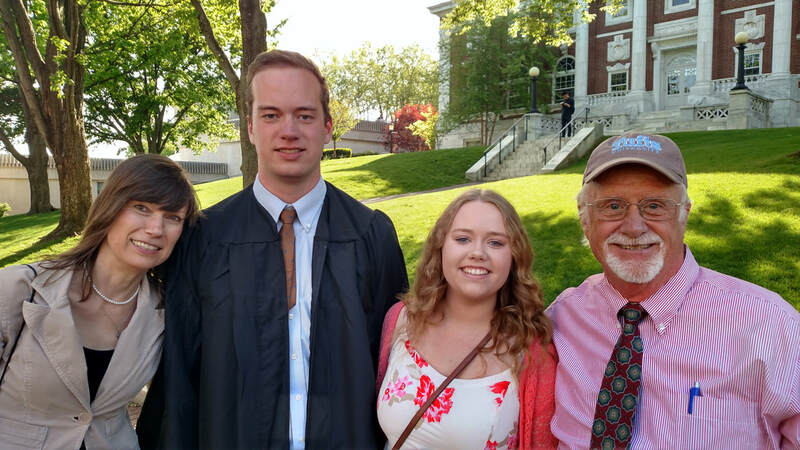 We're a middle income family from Poulsbo, Washington; Greg was interested in electrical engineering and music; and my goal was to find a list of colleges that really fit his needs and that required minimal student and parent debt. I had discovered Net Price Calculator programs in 2009, and they were central to our college search. Greg ultimately matriculated as an electrical engineering major in the Tufts University School of Engineering in the fall of 2013. He graduated in May of '17 with a Bachelor of Science in Electrical Engineering along with a minor in Music Engineering with a concentration in Electronic Musical Instrument Design. While at Tufts, Greg stayed active in music, recording three EPs with his band "Shark Saddle" and also recording four solo EPs and one LP. Tufts is an expensive private school with very generous aid. Its NPC results indicated that we should expect Greg to accumulate about $16,000 in total student loans in his four years there, with no parent loans required. The final results were better than that. No parent loans were required, but Greg's student loans were $5,000 less than we expected, a total of $11,000 over his four years at Tufts. So, Greg's total loans were less than one-third of the national average, and his resulting student loan payments are just about $100 per month. Words, as you might expect, cannot describe how pleased Katia and I are with Greg's experience on "The Hill." Thank you, Tufts, and go Jumbos! While I'm at it, I ought to mention our daughter Maria, the lovely young lady standing next to the old guy in the picture below. She will graduate from Trinity College in Hartford, Connecticut in May of 2019. At Trinity, Maria is carrying two majors - Math and Urban Studies, as well as two minors - Russian and Models & Data. She also tutors other students, she worked two years with disadvantaged youth at the YMCA in downtown Hartford, she just finished a semester abroad in the "Math in Moscow" program, she's done rocket science in Los Angeles during her last two college summers, and she's an active a cappella singer. Trinity, once again, is an expensive private school with honestly generous financial aid, and Maria's final financial numbers should be exactly equal to Greg's. So, Katia and I can only say "Thank you, Trinity College!" and "Go Bantams!" Almost all of my working life has been focused on client service. I've had three actual "careers" since law school: first as a lawyer (mainly as a criminal prosecutor and investigation manager), then as a stockbroker, and finally as a commercial and residential real estate broker. In each of these careers, the needs of my clients always came first, and my goal was to help each of my clients achieve the best results possible in their circumstances. The last of my working careers faded away during the Great Recession, unluckily at the same time that I was approaching sixty and my kids were getting ready to look for colleges. So, I put my client service skills to work on finding colleges that fit both their academic needs and our combined budgets. Just like working for other clients, my goal wasn't to help my kids find "typical" or "average" opportunities. Rather, it was to find the best opportunities available. Working first with our son Gregory, my goal was to find one opportunity that fully fit his needs, then to find another, and another, and then to use what I had learned to develop a convenient, valid, and repeatable method of finding even more great opportunities for him that year and for our daughter Maria two years later. Working with Greg I found that, by using the Net Price Calculator programs that had recently been required by Congress, finding affordable colleges was really the easiest part of a college search. Just pick a school, type "net price calculator" in its website's search box, answer their questions, turn the crank, and record its results. With a little practice, the whole process only took ten minutes or so per school, and then we could be certain whether that school would be affordable for us or not. C. Our family's income was in the same range as the median household incomes of a lot of American states – like Washington, New York, Colorado, California, Minnesota, and plenty of others - making the data I had already collected relevant to a lot of other American families. So, I explained it, expanded it, and published it as the American College Generosity website, a site that's now in its sixth year. In addition to showing families how to do their own financial aid searches and how to make sense out of Net Price Calculator results, I include analyses of the actual costs, available aid, and expected loans (if any) each year at about 125 American colleges for sample families at both the middle and lower income levels. ACG is now used by thousands of American families each year, and it has become a service project for our whole family, with all of us involved directly or indirectly. Realizing that Greg's education was largely funded by the generosity of Tufts University - and that Trinity College is now doing the same for our daughter Maria - we offer this service at no charge, doing our best to show our thanks and broaden the impact of the generosity of their colleges. Let's remember that, when Greg matriculated at Tufts in August of 2013, it was exactly five years since the law requiring Net Price Calculators was passed by Congress and signed into law by President George W. Bush. Let's also remember that back then - due to the failure of government, the schools, and the press - NPCs and the revolutionary impact that NPCs could have on the educations of our students were almost completely unknown. So, what's happened since then? I've been directly involved in promoting NPCs since then, and I can say that NPCs and their potential benefits are just as unknown now as they were then. In fact, I have still never met a parent or student who has heard the phrase "net price calculator" before meeting me. That reflects a failure on the part of four key American institutions, something I cover in more detail on my "Four Presidents" page. To my mind, the most important and valuable resources in America are the best dreams of our children. And, although it may be little known, the system of American college generosity continues to serve our children and their best dreams now as it has for centuries. Generosity was the inspiration for this site, and generosity is its theme. The word generosity frequently came to me as I began helping my son with his college search eight years ago, as I did the same for my daughter six years ago, and as I have continued my research for this site. I have been continuously inspired by the generosity of the alumni and other benefactors of American colleges who have made educations at their schools possible for our children. Sometimes extending back for centuries, their generosity has shown a remarkable and lasting faith in their schools and in the generations of students who would benefit from their gifts. I thank them, and I hope we can show ourselves worthy of both their generosity and their foresight. But their generosity had a purpose. It formed a system, a loop, linking previous generations of students with the present generation. And it was a benefit that needed a beneficiary for its purpose to succeed. Without you, without your openness to that generosity, the loop will be interrupted, and that system of generosity will fail. I originally wrote this site in the last months of 2013, an important anniversary of the seminal event in American college generosity. Three hundred and seventy-five years before then, a very young and well-educated minister died in the Massachusetts Bay Colony leaving half of his wealth and all of his 260 books to a new school founded two years before in a neighboring village, a school named for him in gratitude two years later. Reverend John Harvard intended that his resources and library would be used for the enlightenment of the teachers and students of that new school. But, if his money had just been locked in a safe, and if his books were just locked in cases, the purpose of his generosity would have failed. Instead, his generosity was used to its fullest, becoming an invitation to the generosity of others and resulting in one of the world’s finest universities served by the greatest university library in the world. The system of American college generosity began there in 1638, it continues to spread and flourish, and its fruit is within your reach today. May its purpose be validated in you, may your educations be complete, and may your best dreams be fulfilled.